Connecticut has 17 universities and colleges. More than 79,000 students are enrolled in Connecticut’s private institutions, and more than 122,000 students are enrolled in Connecticut’s public colleges. Yet with so many options, how does a student find the right one for them? It’s not easy, but for many it comes down to identifying the school with the cost, quality and amenities they need to maximize their chance for success. Learn which online colleges in Connecticut are changing higher education in the state, and what that means for college students of today and tomorrow. Each college student is different. The best online school for a single first-year English student may be less-than-ideal for a married dad working on his master’s. It’s this diversity that makes finding the best college unique. In Connecticut for example, the University of Bridgeport offers one-on-one learning opportunities in an asynchronous format. And St. Vincent’s College tailors its programs to working professionals in the healthcare field. That said, some online schools in Connecticut have a variety of resources, affordable tuition and the accreditation to make them stand out across the board. Let’s see which colleges and universities in Connecticut made the list for 2018. Quinnipiac University's online programs highlight both career advancement and flexibility, thanks to its asynchronous delivery of courses, making them accessible wherever and whenever students find it convenient. It is committed to student support, which is demonstrated through academic advisers, who remain with students throughout their programs. Quinnipiac offers 100% online, upper-level bachelor's degrees in business, health sciences and nursing; master's programs in business, communications, education, engineering and nursing; doctoral programs in occupational therapy and nursing; and a variety of certificate programs. The master's programs can be completed in about 2 years. As the second-largest Catholic University in New England, Sacred Heart University boasts a place among the elite Colleges of Distinction, noted for its level of student engagement, quality instruction and successful student oucomes. Its high-quality online offerings include individual online courses and complete online programs. Sacred Heart offers a bachelor's in nursing and a variety of master's degree programs and certificates, including healthcare informatics, nursing, applied psychology and social work. For some programs, such as social work, students can apply for "advanced standing" with prior education in the field to earn their master's degrees in just a year. In other programs, students can expect to earn the degree in 2 year or more. For students who are looking for the flexibility to decide whether they want to take fully online courses, mix it up with on-ground courses or even work on accelerated schedules, Albertus Magnus College provides its Online and Flex Programs, which provide highly customizable education experiences. Because the school has been designing innovative, accelerated courses for working adults since 1985, it has experience in adapting its education offerings for busy students. Available Online and Flex program offerings include bachelor's and master's programs in degrees in arts and sciences, social sciences, business and leadership. The accelerated, 8-week-long classes provide students the opportunity to work quickly through degree programs to career advancement. The University of Hartford sees its standout offering for online courses as personal attention, from the interaction available with the full-time professors teaching the courses to the option to attend courses on campus for a blended experience, to the career guidance provided to students. This personal touch extends to program offerings, which include a variety of online undergraduate courses and the 100% online master's programs in business administration, education (special education and Montessori concentrations), accounting and taxation, management, nursing and organizational psychology. Programs require between 30-36 credit hours, taking at least 2 years to complete. University of New Haven touts that 96% of their alumni report having success in their chosen fields within 6 years of graduating. The university's focus on career development is clear through its 4 online master's degree programs that focus on in-demand careers in specialized professions: criminal justice, emergency management, environmental engineering and investigations. The master's in investigations (a 1-year, 10-course degree) is the first of its kind in the country focusing on white-collar crime in the criminal justice field. The other 3 programs require between 30-36 credit hours and, taken full time, will each take 2 years to complete. As the first university in Connecticut to offer an online degree program, University of Bridgeport has a lot of experience and history behind its online programming. Since launching its master's degree in human nutrition in 1997, the school has expanded its online offerings to 12 programs for undergraduates (in dental hygiene, general studies, professional studies, psychology and RN-to-BSN), graduates (including analytics and systems, business administration and global development and peace) and doctoral students (educational leadership and health sciences). The doctoral program is hybrid, which combines online and on-campus activities, but undergraduate and graduate programs are 100% online. Upon enrolling, students are each assigned an academic adviser that provides one-on-one support throughout the program. University of Saint Joseph prides itself on being military friendly and dedicated to community service. Through its nuanced online programs, students experience flexibility without compromising quality. Programs are offered in fields with high projected job growth. Students can earn RN-to-BSN degrees; master's degrees in biology, biochemistry, chemistry and nutrition; doctorate degrees in nursing practice; and certificates in 5 specialized areas. The courses themselves are flexible, but the program also allows students to enter at the beginning of any semester and does not require students to take courses every semester. USJ is authorized in most states, but not all, so students outside of Connecticut should inquire before enrolling. Charter Oak State College stands out for the ability it offers students to the majority of their bachelor's degrees online. Charter Oak is exclusively an online college that offers 12 certificate and credential programs, 2 associate degrees in general studies, a master's in organizational effectiveness & leadership and its bread and butter, a host of bachelor's degree programs with varying concentrations, including degree completion programs in business, health care, public safety and cybersecurity. Charter Oak also offers students alternative ways to earn credit for a portion of their coursework, for such things as prior learning, credentials, testing, training or portfolios. For seminarians and lay people alike, Holy Apostles College and Seminary offers a unique online liberal arts education experience based in Catholicism and designed to create future religious and spiritual leaders. While many courses are taken in person, undergraduate students have a wide variety of online courses available to them, including apologetics, reading science in light of faith and historical knowledge & human good. Undergraduate, graduate and seminary degrees and certificates in philosophy, theology and pastoral studies either fully online or in a hybrid or blended format. How can I find which online colleges offer the degree I’m looking for in Connecticut? Most schools in Connecticut list their complete program catalog on their websites, including which degrees and courses have online elements. Sacred Heart University has a full list of its online degree programs available to all website visitors. Students can also visit the Connecticut Office of Higher Education’s web page, which lists all the state’s accredited college programs. Additionally, students can find online degrees by using an academic program search feature on the website. Because programs and courses change each quarter or semester, the sooner you can reach out to a college for specific information, the better. Which online schools in Connecticut will accept my transfer credits or work/life experience? Colleges in Connecticut establish their own policies regarding transfer credits, and some policies vary by field. For instance, Charter Oak State College and Sacred Heart University provide students with life experience or prior learning credits to save them time and money. To qualify, students must document their knowledge and why it should replace specific program courses. Other schools let students transfer their credit hours from other accredited colleges in the state. Typically, the number of transferable credits is limited. Students can speak directly with an enrollment adviser at the prospective college to see if the school accepts transfer credits. How Much More Do College Grads in Connecticut Make? Many students attend college assuming it’s the path to a higher salary, and in many cases, it is. The following table shows the average pay Connecticut professionals receive based on their jobs’ minimum degree requirements. Looking at the Bureau of Labor Statistics data, it’s clear that college degrees pay. Careers in Connecticut that require bachelor’s degrees pay nearly $40,000 more per year than those that require just a high school diploma. Positions requiring a doctoral degree as the minimum standard pay an estimated $80,000 more than those for diploma earners only. Even though college tuition may be on the rise, a college degree has earning power, and can pay off—literally—in the short- and long-term in Connecticut. The top jobs in the state’s market span many industries and fields. Connecticut’s most in-demand jobs include financial managers, groundskeeping/landscaping workers, cooks and office supervisors. Other growing occupations in Connecticut are teaching and nursing assistants, accountants/auditors, childcare workers and registered nurses. With the growth of online schools in Connecticut comes a sharper eye on quality. What signifies quality and how do you know which level of accreditation is actually legitimate? So many colleges out there say they have the proper accreditation when they really don’t. Here’s how to tell the difference. The most important accreditation a college can receive is regional, granted by one of twelve accrediting bodies recognized by the U.S. Department of Education. Regional accreditation—as opposed to national accreditation—means the school and its programs have a certain level of quality, a commitment to growth and a coherent mission to back them. 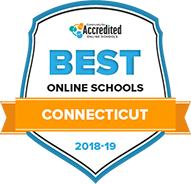 A top-ranking online school in Connecticut is the University of Connecticut, which is regionally accredited by the Commission on Institutions of Higher Education of the New England Association of Schools and Colleges. Along with regional accreditation, many top online universities in Connecticut have specialized accreditation for individual programs. For example, the University of Connecticut’s business school is accredited by the Association to Advance Collegiate Schools of Business (AACSB). The business school offers an online master’s degree and a certificate program in accounting. Covering college tuition is a primary concern for students. However, many of Connecticut’s highest-paying career opportunities require a degree. The following sections provide an overview of the current costs of online education in the state. These numbers reflect in-state tuition and required fees only. They do not include room, board or additional fees that may be considered optional, e.g. parking. To attract more online students, some Connecticut online colleges are making their tuition rates more accommodating. For example, undergraduate students at Western Connecticut State University pay an estimated $40 per credit hour more than on-campus resident students. Meanwhile, the tuition rates at Post University differ according to the types and levels of the programs. The fees and costs are the same for residents and non-residents, with lower rates for distance-learning students than for on-campus students. In addition, some colleges place all online programs under the in-state tuition rate, regardless of where the student lives. The following are some common questions regarding Connecticut’s online college costs. What are Connecticut’s requirements to qualify for in-state university tuition? In Connecticut, students qualify for in-state university tuition by establishing residency for a minimum of one year before the first day of class. These rules don’t apply to distance-learning students who can pay the Connecticut in-state tuition costs described above. Are online credits more affordable in Connecticut than in other places? The University of Connecticut-Waterbury is at the lower end of tuition costs in Connecticut, with in-state students paying close to $12,800 in tuition and fees, and out-of-state students paying around $34,900. Meanwhile, the University of Connecticut is at the higher end, with in-state students paying $14,880 and non-residents paying $36,900. Both the lower-end and the higher-end tuition costs in Connecticut are below the average total tuition cost in the United States, which is $16,700. Comparisons do not include technology and other fees that nay be imposed by different colleges and universities. How can I get help paying for online college in Connecticut? The most popular option for funding higher education is federal financial aid. Start by researching and applying for aid via FAFSA. It’s free to apply, is need-based and as long as you’re attending a regionally accredited institution, you should have no trouble. Scholarships are another great option for students of all levels. Check out a few scholarships available to Connecticut online students. Bob Eddy Scholarship Program to Foster Journalism Careers: This scholarship is for students attending an accredited higher learning institution in Connecticut. The scholarship amount is $2,500. Eileen Kraus Scholarship: This scholarship is available each year to an outstanding woman in Connecticut who is about to start her first year in college. The scholarship is valued at $5,000. James P. and Debra Fitzgerald Healy Foundation Scholarship: This scholarship offers financial help to college-bound students who suddenly experienced a financial change and need money for college. Eligible students are in their junior or senior year at a four-year school with a minimum 3.0 GPA. The scholarship amount is $3,000. Between July 2016 and June 2017, more than 19,000 people in Connecticut participated in adult education programs. These programs often form a cooperative that makes it possible for aspiring students to accomplish their higher education goals. Complete a High School Diploma Getting a diploma in Connecticut is easier than ever thanks to the State of Connecticut’s adult education program, which offers Adult High School Credit Diploma, National External Diploma Program or GED/ABE options. Academic and Technical Prep for College From computer learning classes to English as a Second Language, Connecitcut residents can take advantage of low- and no-cost basic education and training programs. College and Career Counseling Students who aren’t sure what kind of degree they’d like to pursue can take advantage of college and career counseling profiled by Connecticut’s adult education offices. Connecticut students can find local adult education programs and contact information on the Connecticut State Department of Education website.